This house has a different approach of using a spiral staircase. We are all aware that there are different types of staircase designs. With the trend of modern and contemporary design these days, we would usually see simpler designs of stairs but would experiment on the usage of materials. You can see wooden stairs that adds a combination of steel and glass for the railings. There are also many creative ways of designing a stairs. For this house that we will feature today, it has a beautiful sculptural staircase that is the focal point of the house. 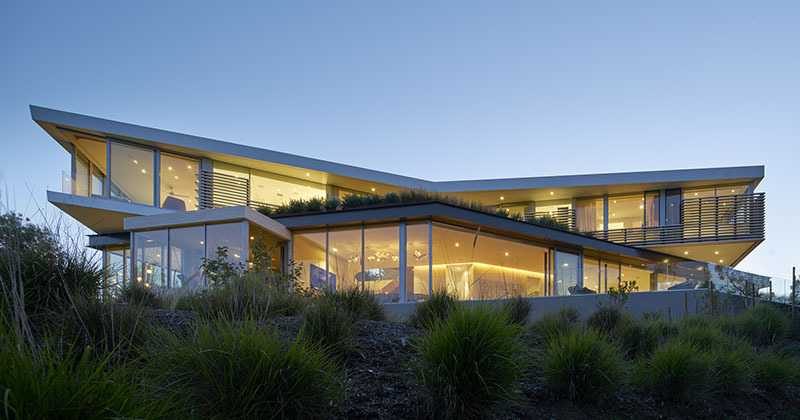 The Tree Top Residence celebrates the complex landscape of the site and merges that seamlessly to the house. Built along a natural ridgeline, the three-story house sits on a long and narrow plan that mimics and inverts the angles of the site’s topography. 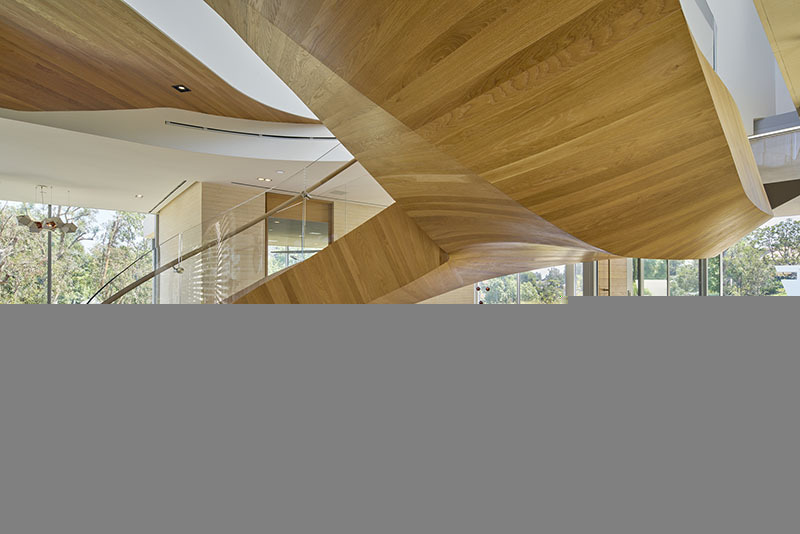 Vertically, it features an eccentrically-helical stair that functions as a primary organizing element of the home. 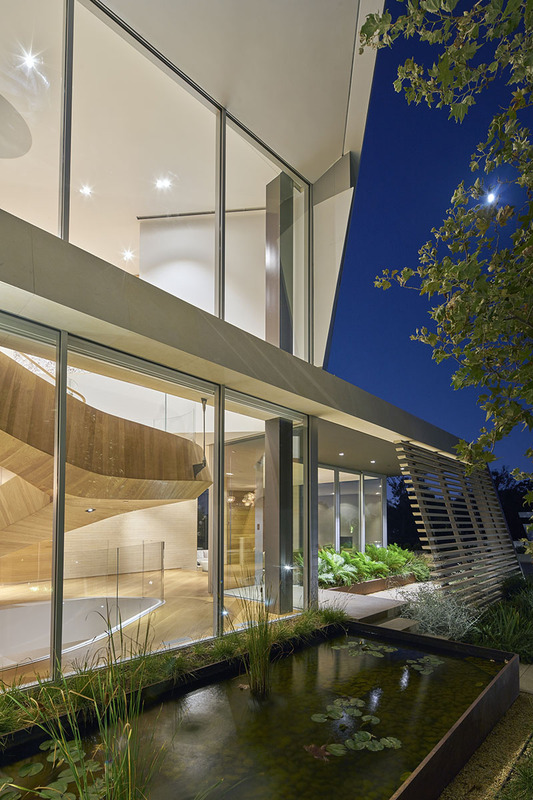 It also acts as a sculptural gesture upon entry into the house. On the ground floor of the house, it acts as a threshold into the open plan. Above the home, it separates the master suite and children’s quarter and provides alight well to the basement. Horizontally, the walls fluidly connect the spaces wherein access and traffic in the dining areas, kitchen, play and gathering spaces are uninterrupted. There is also a floor-to-ceiling sliding glass doors that blend the interior with the outdoor areas. Canted limestone louvers, and dense planting on the north facade of the house gives privacy to the dwelling. The design of the Tree Top Residence culminates in the master bedroom that features a full-height sliding door at its cantilevered corner. Unique feature: This sophisticated home is far more than ordinary since it has a huge wooden spiral staircase in the interior which serves as the highlight of the home. Belzberg Architects designed a new home on a hillside in Los Angeles which features a significant spiral staircase at the entry to the house. As you can see, the facade of the house looks very unique featuring a beautiful design in the roof and just about every corner of the home. On one part of the house, this is how it looks like. You can see here that the design isn’t just unique but it is also complicated as well. Notice also that tall floor to ceiling windows are used for the home. The house is hidden from the street and insulated from its neighbors but it is open to its site. You can get a glimpse of the home’s impressive landscaping in this photo. And yes, the house appears transparent on some areas because of the glass windows used in it. As you can see, the house has a unique shape and design. In the picture, notice the planters in the exterior and the lovely interior of the home. You can also see that some parts of the home is elevated from the ground level. 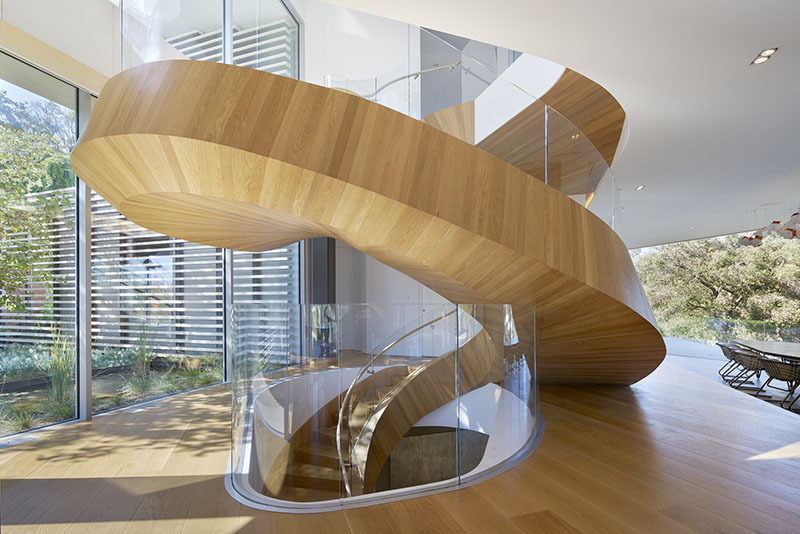 An eccentrically-helical stair functions as a primary organizing element in the house. It is considered as a sculptural gesture once one enters the home. It sure is huge, right? And it combines wood and glass in it. Various furniture designs are used for this living area and the combination is indeed nice. It is also bright because of the glass windows. On one side of the wall is the fireplace which has a textured wall, adding appeal to the space. It is also good that curved and straight lines are used in here. This is the bedroom of the house which is also surrounded with glass windows as well allowing a good view of the outdoor space. It use simple furniture in here but it does look really comfy. Apart from the bed, it also features a bedroom lounge as well. That red leather chair adds appeal to the space. A closer look at the spiral staircase. You can see that it used glass for its railings. With its neat design underneath, it appears like a slide but of course, there are treads on it which are used to access the different levels of the house. Isn’t it beautiful? It sure is a sculptural feature of the home indeed. It just looks really nice as it combine together glass and wood for it. It sure is unique to have a huge spiral staircase inside the house. 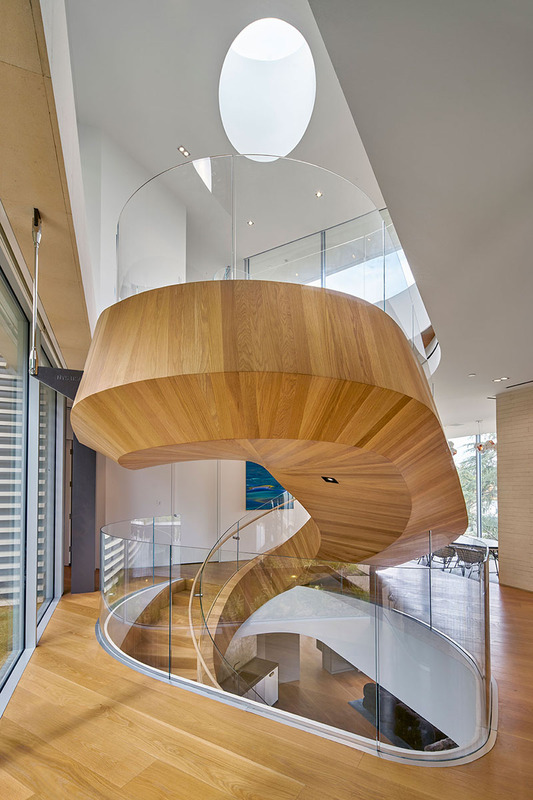 Commonly, a staircase like this is being added to a home with limited spaces but for the case of the Tree Top Residence, it used a spiral staircase as a sculptural element in the home’s interior. Aside from the stairs, the entire interior also looks really great too. 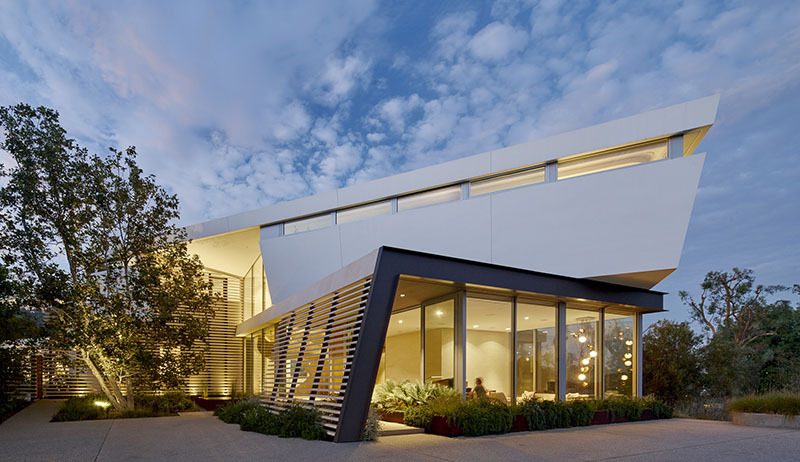 This home is designed by Belzberg Architects and it was able to give the house a stunning appeal both in the interior and the exterior. Its interior has a nice layout with a luxurious appeal while the exterior is really unique as it played with shapes and lines. What can you say about this house?